Theory and Modeling of Dispersed Multiphase Turbulent Reacting Flows gives a systematic account of the fundamentals of multiphase flows, turbulent flows and combustion theory. It presents the latest advances of models and theories in the field of dispersed multiphase turbulent reacting flow, covering basic equations of multiphase turbulent reacting flows, modeling of turbulent flows, modeling of multiphase turbulent flows, modeling of turbulent combusting flows, and numerical methods for simulation of multiphase turbulent reacting flows, etc. The book is ideal for graduated students, researchers and engineers in many disciplines in power and mechanical engineering. Presents applications in a wide range of engineering facilities, such as utility and industrial furnaces, gas-turbine and rocket engines, internal combustion engines, chemical reactors, and cyclone separators, etc. 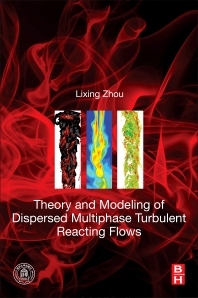 Prof. Zhou is a leading scientist in CFD modeling of multiphase flows of combustion in China. He got his Ph.D. degree from the Leningrad Polytechnic University, former USSR in 1961. He was once the Chairman of Multiphase Fluid Dynamics Division, the Chinese Society of Theoretical and Applied Mechanics, and was a member of the Board of Directors in the Chinese Section of the Combustion Institute. He also served in the Governing Board of the International Conference on Multiphase Flow. Currently, he continues to play an active role in many scientific committees of international symposiums on multiphase flow and combustion. Prof. Zhou’s research area is numerical simulation of multiphase turbulent flows and combustion. His main contribution lies in the theory of particle turbulence and a new “SOM” modeling theory of turbulence-chemistry interaction. He won the China National Awards of Natural Science in 2007, Science and Technology Progress Awards of First Degree by the Ministry of Education and the Ministry of Electricity of PRC in 1995, and China National Awards of Excellent Scientific Books of First Degree in 1992. He has published one monograph in English and 5 monographs in Chinese, and more than 360 articles in journals and international conferences. He is the author of following two books: “Theory and Numerical Modeling of Turbulent Gas-Particle Flows and Combustion (in English)” in 1993, and “Dynamics of Multiphase Turbulent Reacting Fluid Flows (in Chinese)” in 2002. The proposed new book will be the extended and revised English edition of these books, providing the latest research advances and the achievements of Prof. Zhou and his colleagues in the last two decades.